After Sunday’s Amstel Gold Race, the Ardennes classics continue with the 78th running of the ‘Walloon Arrow’, Flèche Wallonne. Can Philippe Gilbert make it three wins in the space of a week? The race starts in Bastogne, the mid-point of Sunday’s Liège-Bastogne-Liège, although the two races do not share any climbs. The parcours is undulating but relatively benign for its first 80km, with its 11 categorised climbs all coming in the final 120km. 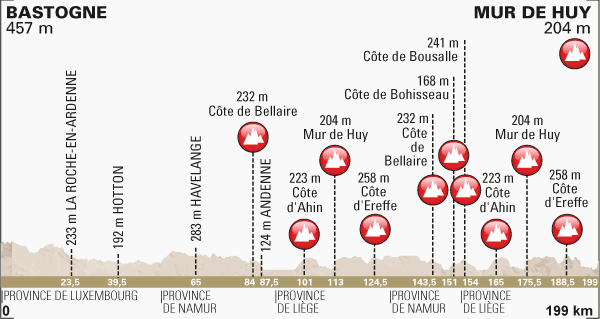 The race ends with multiple circuits in and out of the town of Huy, with the third ascent of the famed Mur de Huy (1.3km, 9.3% average, 19% maximum) providing its climax. ‘Home’ riders account for nearly half of all Flèche Wallonne winners – 38 of 77 have been Belgian, including the first 11 consecutively. There have only been two non-European winners: Cadel Evans (then reigning world champion) in 2010 and, ahem, Lance Armstrong in 1996. Eddy Merckx is one of four riders to have won Flèche three times, the most recent being Davide Rebellin (2004, 2007, 2009). The last two editions have both been won by Spanish riders from Katusha: Joaquim Rodriguez in 2012 and Daniel Moreno last year. If BMC’s Philippe Gilbert wins, all bets are off for Liège. As in 2011, the Belgian enters this race having won both Brabantse Pijl and Amstel Gold. After winning Flèche, he then completed the clean sweep in La Doyenne. For form guidance, look no further than last Sunday’s results. Coming off his Brabantse Pijl and Amstel Gold victories, Philippe Gilbert will start as favourite for a race which he has won (2011) and finished third in (2012) over the last three years. However, BMC are unlikely to be able to spring the same plan they executed so flawlessly on Sunday, where Greg van Avermaet, Marcus Burghardt and Samuel Sanchez played key roles in setting up Gilbert for victory. BLOG: Amstel Gold review: Phil Gil is back! Lotto-Belisol’s Jelle Vanendert broke free of the trio of Simon Gerrans (Orica-GreenEDGE), Alejandro Valverde (Movistar) and Michal Kwiatkowski (Omega Pharma-Quick Step) on the final run-in to the finish – the second time in three years he has finished as runner-up in Amstel Gold. He also finished fourth in Fleche in 2012, so he will be confident of another good result. Having had a quiet start to the European season, Gerrans looks to be back to the form which saw him capture his second Tour Down Under crown back in January. Valverde and Kwiatkowski both looked a little short of their best on Sunday. Given how strongly they have performed over the couple of months, it wouldn’t be a surprise if either or both are just starting to taper down in form. The nine-man Fantasy Ardennes team we selected in our most recent podcast supplied five of Sunday’s top nine. In addition to Gilbert, Valverde and Kwiatkowski, Belkin’s Bauke Mollema was seventh, while Katusha’s Daniel Moreno finished ninth. As a Dutch rider, Mollema’s main focus was Amstel Gold, although he has finished in the top ten here in each of the last two years. Moreno won last year’s edition and is set to lead Katusha again despite Joaquim Rodriguez being cleared to start after withdrawing with suspected concussion after an early crash on Sunday. If any team is going to upset the apple-cart with a well-laid plan, watch out for Astana. The Kazakh squad will be led by Vincenzo Nibali, but with the Sicilian still feeling his way into form he may give way to one of Jakob Fuglsang, Enrico Gasparotto or Maxim Iglinskiy, the latter two the winners of Amstel Gold and Liège-Bastogne-Liège in 2012. Trek’s Andy Schleck may be a non-starter. He was caught up in the same accident as Rodriguez at Amstel and has knee trouble, as does reigning Liège champion Dan Martin (Garmin-Sharp), who can be considered no more than a dark horse given his limited programme so far this season. Sky have opted to rest Geraint Thomas after yet another crash on Sunday. Previous PostTweets of the Week: Gold! Beer! Thrones!